Kevin Fiege got his No Prize for taking a second tier superhero in Iron Man and making him likable despite the fact he was a giant jerk with no box office appeal (okay an actor may have helped out with that challenge too). An entire movie universe has been built on this key decision. But now the comic book Tony Stark has a new attitude. Is it one that this Agent will like in Superior Iron Man #1 “Chapter 1: Nightmare Scenario”? In a recent battle (which will not be discussed here), Iron Man and the Avengers were victorious but Tony Stark came away with a massive personality change. Basically, Stark is a jerk again. Tony offers the city of San Francisco, his new home, Extremis 3.0 that makes you the best you possible. For Tony that means giving up his sobriety, partying with the pretty people and putting Tony first. The change for Iron Man is an Endo-Sym Armor, which includes a symbiot interface and a cool chrome finish! Everyone who was able to access the Extremis 3.0 application has been able to become one of the pretty people, creating a new class war as not everyone could get to the app. Yes the city is divided between supermodels and hobos. But Tony reassures Pepper Potts he has the solution to this new social dynamic in the city. And of course this plan will make plenty of money for Tony. Tony Stark, you are a jerk. You are unlikable. Sure Captain America is now Falcon and Thor is a lady but from a story level, Stark’s turn is the worse. I get it with a hero with over 50 years of history it can be hard to write stories about growth unless you jerk him up a bit. But seriously, you are a nasty little hero. And Daredevil has plenty of reason to not trust you. If Marvel wanted a jerk Stark, author Tom Taylor and artist Yildiray Cinar fulfilled the order. Seriously, I am even a little mad at Robert Downey Junior right now. Two people do not seem caught up in the euphoria that Tony has brought the city, Pepper Potts and Daredevil. They are the only ones that see what is really happening to the city. And I think they are just as horrified as we are when Tony’s next step becomes clear. Because seriously, it is not pretty, I am not making that up! I will not be following this series month-to-month. Again, Iron Man is not a hero that I have loved in the comics. And I really do not track him monthly at the moment. If I had to add a new comic right now, seriously someone force me, I would put Bucky Barnes: The Winter Soldier or Thor first in line. So I will be reading more Iron Man in the future, but it will be as a borrow. 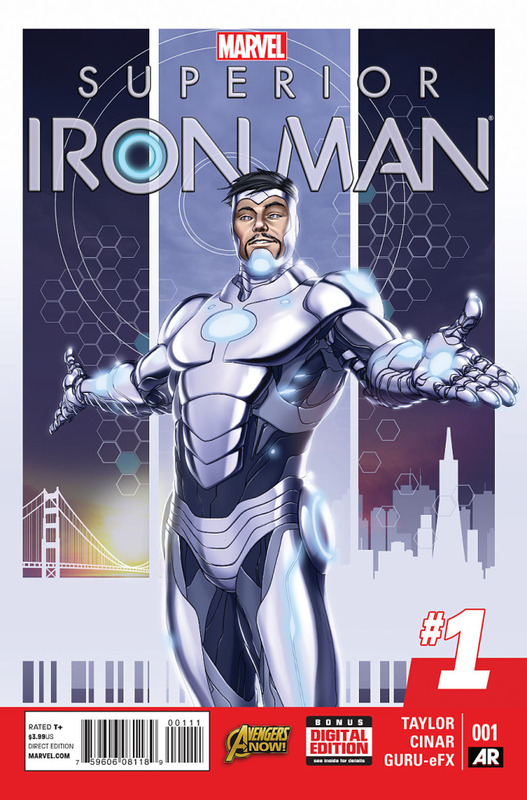 We will see the Superior Iron Man back here in the comic files when the first arc is collected in the trade. But I have never been a massive fan of Iron Man in print. And this change has not increased my enjoyment of him. In short, it will be interesting to see what is coming next. But like all Iron Man stories since I pulled “Armor Wars” off the spinner rack, I will not be following monthly.